Customer relationship management is a journey, often advanced with small but continuous incremental, iterative and progressive steps which steadily improve customer relationships and achieve organizational objectives. CRM strategies and supporting CRM software systems must evolve to keep pace with changes to business strategies, business processes and customer behaviors. 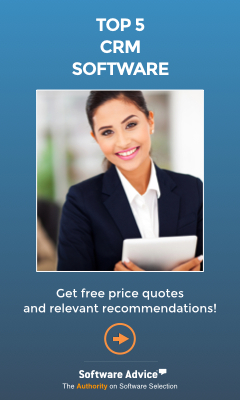 This CRMsearch.com channel provides recommendations to advance your customer strategies and increase your CRM software technology return on investment. CRM is neither a project nor a destination. Unlike many software technology projects, with CRM software adoption there is no end. CRM strategy and supporting software is a continuous journey and those organizations that are most successful repeatedly assess, learn and make adjustments - and then repeat the closed loop process all over again. CRM isn’t a one-and-done technology project. It’s a journey. The CRM Maturity Model helps proactively navigate the journey and identifies how to keep your CRM strategy and software in alignment with your customers evolution. This approach helps better engage customers, influence spend behavior, grow customer share, increase Customer Lifetime Value (CLV) and keep your customers longer. Companies don't get to decide how customer-centric they are. That's decided by their customers. For companies to understand, manage and profit from customer-centricity, they must implement an objective scoring system, create a performance baseline, and report results to know when customer strategies are working or course corrections are needed. Too many IT projects begin without a clear return on investment. Without a calculated payback, an IT project is little more than wishful thinking, has little basis to survive scrutiny and even when completed, is at much higher risk of failed user adoption because the perceived business disruption is greater than the questionable benefit. The Business Value Assessment can aid this challenge. A common challenge of large companies is the consolidation of many separate and siloed CRM systems into a single, enterprise-wide CRM application. Many times large or decentralized businesses accumulate separate CRM systems via acquisitions or departmental initiatives. Here are some recommendations and program governance measures to help get everybody on the same application. Apple invests 5% of its revenues in R&D. Facebook invests 13%, Google 16% and Amazon now invests 28% in R&D. So how much should you invest? Here are perspectives and methods to align innovation budgeting with revenue targets, provide comparison to peers and industry averages, and suggest how much money you may want to invest to achieve your innovation goals. There are three types of innovation (product or service, business model and operational) and three innovation methods (incremental, transformative and disruptive). The combination of these types and methods define your innovation strategy. Viewing your innovation strategy holistically can show a balanced mix of options that make the most sense. Innovation isn't born from wacky ideas or aimless expeditions. It's cultivated from a creative process that advances proposed innovations through a maturation process. The Vantive Innovation Framework™ is a 5-step methodology that harmonizes people, processes and tools and brings objective measurement to an otherwise difficult to measure undertaking. Business leaders are discovering innovation can be learned, the cost of innovation is in decline and innovation is a top business growth accelerator. Innovation accelerates revenues, increases margins and grows companies. Gartner reports that, "Companies pursuing breakthrough ideas are able to generate up to twice the product sales of their peers." The Vantive Prototyping Process™ is a well-defined, fast paced, high-velocity prototyping method used to efficiently advance an innovation concept to commercialization. This process discards those ideas that are not feasible or financially rewarding, or advances those ideas that may convert a novel idea into a unique product, service or experience that delivers value. The most important innovation metrics are not related to innovation speed, cycle time, cost or other internal measures. The measures that will most influence market success are customer measures, such as how customers measure value when making purchase decisions. Here are the four types of innovation measures needed to demonstrate progress toward market success. By turning some of the typical CRM software challenges into opportunities, organizations can further advance today's CRM solutions into powerhouses of information and customer relationship-building tools. Here are the top 5 methods savvy executives and IT pros can take to ensure their customer relationship management (CRM) software investment pays off. If you think you are getting the most out of your CRM system, consider the possibility that you're wrong. Blending achievements such as unified customer records and personalized messaging with new CRM capabilities such as social media integration, mobile CRM and business intelligence or analytics can take your CRM system to the next level. Here's how. SaaS CRM vendors look prophetic at the moment, showing up just ahead of the rise of cloud computing and the demand for everything as a service. Several have even launched their own third-party app stores tapping yet another wildly popular trend. While Microsoft and Salesforce are indeed pushing ahead of the pack on third-party app marketplaces, they are not the only players in the field. Aligning CRM software with CRM strategy is a journey that requires constant care and feeding. A successful implementation isn't a conclusion, it's the beginning of the journey. The first day of post-implementation marks the transition from designing CRM software to achieve CRM strategy to actually executing the mission. The more effectively you integrate your business processes with your CRM software the more quickly you will achieve your goals and a sustained payback. That means achieving automation, productivity and information deliverability for all customer facing staff – which is not accomplished in a one-time implementation event. Here are four ways to get more out of your CRM investment. Even if you get the expected ROI from your new CRM software system, it doesn't mean you've gotten the maximum out of it. By observing a few simple principles and fine-tuning your processes you can make your CRM project even more productive, probably in ways that aren't immediately obvious. Here are some suggestions to get more payback from your CRM investment. CRM strategy and supporting CRM systems must mimic and adapt to your constantly evolving business environment. Failure to continually measure, monitor and improve your CRM processes and systems will leave your business strategy and CRM systems misaligned. Case in point: Royal Caribbean Cruise Lines failure to recognize their customers distress during a cruise to Haiti. So once the CRM implementation is complete, what comes next? CRMforecast.com includes several excellent hubs on CRM strategy, implementation and technology. This site is rich with with solid best practices and helpful insight. CRMsolution.com offers concrete advice regarding CRM strategy and objectives, several best practices, CRM reports and a comprehensive Blueprint which includes the business case for CRM as well as number of key success and failure factors.